Amid the turbulence of the past few weeks, it has been President Trump who has kept his head while others have lost theirs. Trump may be the one man in America who can detoxify racial relations—I mean actually do it, not exploit them in the mode of Black Lives Matter or Al Sharpton. Let us first be clear: No one on the political Left can possibly succeed in easing racial tensions. Their identity politics approach has played itself out beyond the limits of absurdity. That is what the reassignment of the Asian-American sports announcer, Robert Lee, really demonstrates. This farcical episode, made ESPN a mockery, even to some on the Left. The battle lines in this ongoing fight for the political soul of America became obvious mid-day on January 20, 2017, when President Trump took his oath of office and Democratic Senate Leader Charles Schumer, poised to introduce Justice Clarence Thomas intoned a Monty Pythonesque litany, “Whatever our race, religion, sexual orientation, gender identity, whether we are immigrant or native-born, whether we live with disabilities or do not, in wealth or in poverty, we are all exceptional….” Schumer’s emphasizing these distinctions, many of which a civilized society should be seeking to make irrelevant or, at best, secondary, actually produces a more fractured society; one less likely to reconcile differences in order to produce a common good. When you open your heart to patriotism, there is no room for prejudice…. Trump’s approach to this issue is the only method that can redirect this country to a politics of the common good and thereby help to heal its often exaggerated racial and ethnic divisions. The Left disdains the old patriotic symbols, and too much of the right is cowardly or echoes the left. Some NeverTrumpers even adopted identity politics to oppose Trump, as the absurd candidacy of Evan McMullin exemplified, a nonentity selected for his Mormon faith to create Electoral College mischief. Charlottesville, however, was the telling moment. With the aid of viciously anti-Trump left-wing media, a tiny cabal of neo-fascists attempted to hijack Trump’s campaign and inaugural message of American unity in the Robert E. Lee statue controversy. The absurdity of this attempt is nonetheless overshadowed by this partial success: A small claque of politically irrelevant losers, professing a foreign ideology at war with American principles, somehow persuaded the media to give it free publicity and prominence. Why might that be? The leftist media and their imbibers thus grotesquely magnified the torchlit “blood and soil” chants of neo-fascist provocateurs. The media and those too unthinking to question it became useful idiots to these neo-nazis. The contentiousness over the statues became a narrative of a battle between pro-statue neo-fascists and anti-statue anti-racism activists. The leftist media and their imbibers thus grotesquely magnified the torchlit “blood and soil” chants of neo-fascist provocateurs. The media and those too unthinking to question it became useful idiots to these neo-nazis. Trump was not only accurate but politically astute in denouncing both mobs and wresting away the monuments cause from the media-fueled putsch. His only rhetorical error was in failing to note the similarities between the neo-fascists and Muslim radicals as advocates of a violent, anti-American foreign ideology. Trump’s basis for unity in American patriotism is vindicated in the turns the anti-statue movement has taken as it spirals into increasing absurdity. But at stake here is more than the appreciation of public art. Trump’s understanding here is that of the Gettysburg Address, the most unifying statement—prayer or psalm, really—concerning the meaning of American citizenship. Contemporary multiculturalism, prized by the Schumers and the media and the universities of today, repudiates Lincoln and with him the truest, the most elevating, and the most unifying American teachings. The Charlottesville aftermath raises the question of how might one convert anyone from one point of view to another, let alone from identity politics fascism—which, Trump was correct, infects both sides. Isn’t mutual trust the beginning? The Left will never gain the trust of the neo-fascists. While they mouth words of love, in fact hatred of the other is the only unifying principle for identity politics, and in this central passion today’s Left has more in common with the neo-fascists than it does with anything truly American. He has the trust of many white working-class voters without higher education, not because they are white, but because their uneasiness with race in our fraught and “multicultural” times has caused them so often to be mislabelled as racist, and they rightly resent it. His policies and rhetoric give him the ability to change the Republican Party in ways that welcome blacks—in particular striving, working-class blacks—into a political coalition with a new confidence in an America that seeks liberty and justice for all. Shed of the slur of being fascist-friendly, Trump is in a position to unify here because he hearkens back to American ideas rather than to any group identity, including even partisan ones. He has the trust of many white working-class voters without higher education, not because they are white, but because their uneasiness with race in our fraught and “multicultural” times has caused them so often to be mislabelled as racist, and they rightly resent it. His policies and rhetoric give him the ability to change the Republican Party in ways that welcome blacks—in particular striving, working-class blacks—into a political coalition with a new confidence in an America that seeks liberty and justice for all. 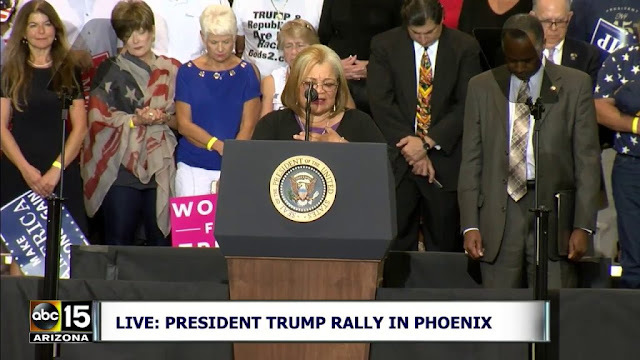 We see this in obvious ways, such as in Trump’s calling upon allies like Martin Luther King’s niece, Dr. Alveda King, and Dr. Ben Carson to warm up crowds at his recent rallies. Clearly, Trump’s overwhelmingly white audience is not expected to have contempt for these black leaders, but to welcome them as natural allies and fellow Americans who believe in and want the same things. It may be the case that Trump’s visit to the Carson childhood home in the Detroit slums and a nearby black church, helped to win Michigan for Trump. In this regard, Trump emphasizes the economic appeal of his programs to working class blacks in the same ways that he emphasizes these points to working class whites. Whether it is a restoration of the manufacturing sector of the economy or in his calls for law and order and common sense immigration restrictions, these policies will spur economic improvements for the nation that will be felt very directly in these communities. Complementing these with moral messages on issues such as abortion, drug use, family disintegration, and gangs, Trump clearly wants to make middle America and middle Americans, of every hue, greater than ever before. He wants Americans to believe in themselves and in each other again. Republicans in the mainstream generally offer only paler versions of Democratic identity politics, but Trump has the opportunity of clarifying American identity in the nationalism of the American founding and its abiding principles of equality and limited government by consent. With 13 percent of the votes of black men in 2016, Trump is in an enviable position to increase his vote totals and end the days of the Democratic Party taking the “black vote” for granted. A black male vote total of around 20 percent would mean the disintegration of the Democratic coalition. But might Trump’s defense of Confederate monuments hurt him with black voters? According to a Marist poll, a plurality of blacks, 44 percent, favor retention, and 40 percent favor removal, with a high 16 percent remaining uncertain.Trump can proceed with confidence because the opportunity to unify both his support and the country is so clearly presented in this issue. Republicans in the mainstream generally offer only paler versions of Democratic identity politics, but Trump has the opportunity of clarifying American identity in the nationalism of the American founding and its abiding principles of equality and limited government by consent. That is the deepest meaning of the unifying message of making America great again.